This book comprises of ten short auto-biographies by young Tibetan women from the Kham and Amdo regions which are now located in the Chinese provinces of Qinghai, Gansu, Sichuan, and Yunnan. In 2003, American Michelle Kleisath went to Xining in order to teach sociology at The English Training Program (ETP) at Qinghai Normal University. She also developed several extra-curricular gender studies courses from which this book slowly arose. 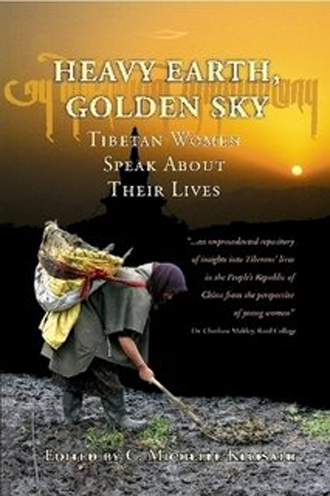 The stories cover several aspects of the lives of rural Tibetan women in these areas. We learn about the rigorous routines that female farmers must undertake day after day to keep their families thriving. We also learn about the value that education holds for improving the lives of entire families and about the qualities that women are expected to develop in their culture. In several of the stories we read of the unimaginable efforts that these families went through in order to send their daughters to school. Most of all, these stories show ten women who had to strive beyond belief to obtain an education which would then allow them to give back to their communities in effective ways. Heavy Earth, Golden Sky deserves praise on several grounds. First of all it is the Tibetan women who are writing directly in English for an English-speaking audience. Until now the information we have gotten about Tibet, and especially Tibetan women, has been through one of two lenses: either that of foreigner researchers, scholars or tourists who have reported what they had seen or through the translation of Tibetan texts concerning women. The reports by foreigners, albeit helpful, have undoubtedly left out a considerable amount of information which this books attempts to retrieve. We learn not only about the status, conditions and resistances of women’s life – the most common foreigners’ focuses – in rural Tibet, but also about their aspirations, their perceptions and their chosen paths for improvement, which are not always what foreigners would prescribe. On the other hand, the translations that have been done from Tibetan to English speak of highly educated or at least highly realized women who tell successful stories about spiritual journeys. Although these stories have served to be inspirational to Western practitioners as well as Tibetan women, they have failed to describe the daily struggles of typical Tibetan women. This book offers deep insights about the more “mundane” journeys of receiving an education, keeping harmony in the family, and surviving agonizing poverty. These stories are at least as inspiring as the spiritual warrior journeys. This book catches the readers, not only because of its moving stories, but also because of how beautifully written these vignettes are. We are transported at times to beautiful settings in the countryside, savoring tsampa or instant noodles, or to beautiful shrines where Tibetans strive to follow the Buddhist path. We are deeply impressed that, in such a short time, these women have managed to develop their English skills sufficiently to master these delicious literary pieces. Even with all the editing that might have taken place after the stories were written, it could not have been done if it was not with already catching and wonderfully written pieces. We can only hope that we will hear more from them! Even though we learn, through the stories, about the difficulties of rural life in Tibet, there is no mention, even once, of the political issue of Tibet. This is not surprising, considering the troubles that they would get into if they were to criticize the Chinese regime. In this sense, we are left intensely wondering about the political views of these girls. Are they not involved in politics and therefore challenge the view of Tibetans in exile that perceive most Tibetans in Tibet as greatly dissatisfied with the conditions of the Chinese government? Are they well aware that some of the difficulties they experience are due to the Chinese policies but they have chosen not to speak about this in order to continue to work effectively in their communities? Probably the answer lies somewhere in-between these two extremes. However, possible self-censorship is worth keeping in mind while reading this book which, although necessary, erases important aspects of the Tibetan situation to the reading public. It is saddening that there are parts of these women’s lives which we cannot have access to due to tight Chinese pressure on what gets said by whom. And, even if these women’s lives do not surround politics, as we sometimes imagine most Tibetans’ lives do, it is disconcerting that we cannot be sure, as we know that they could not have said anything to even slightly criticize the Chinese government. But apart from this inevitable shortcoming, this book is read with immense joy, sadness, pleasant melancholy and deep inspiration and admiration for the work that these women have done.